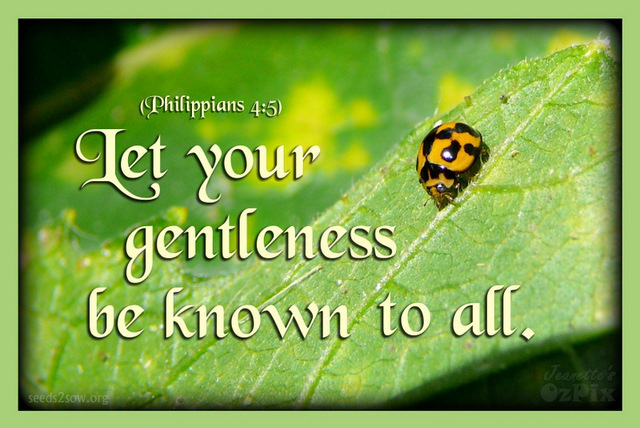 Gentleness, also translated “meekness,” does not mean weakness. Rather, it involves humility and thankfulness toward God, and polite, restrained behavior toward others. The opposites of gentleness are anger, a desire for revenge, and self-aggrandizement. However, in church, as he hears his daughter singing a hymn, the smith is overcome with emotion, “And with his hard, rough hand he wipes / A tear out of his eyes.” This is gentleness. Might restrained. Humility and grace. God wants us to give Him control of our lives. Relying on our own logic, we have no impetus to submit to God’s leadership. With the wisdom given to us by the Holy Spirit, however, we begin to see why we should completely submit to God as Lord of our lives. Human power under human control is a half-broken weapon in the hands of a child. But gentleness places our strength under God’s guidance; it is a powerful tool for God’s kingdom. Every person is powerful. We can speak words that influence others; we can act in ways that help or hurt; and we can choose what influences will inform our words and actions. Gentleness constrains and channels that power. To be gentle is to recognize that God’s ways and thoughts are high above our own. It is to humbly realize that our worldviews are shaped by exposure to sin and the misinterpretation of experience. It is to accept God’s worldview, reflecting truth about the spiritual and the material worlds. When we are filled with the Spirit’s fruit of gentleness, we will correct others with easiness instead of arguing in resentment and anger, knowing that their salvation is far more important than our pride. We will forgive readily, because any offense toward us is nothing compared to our offenses against God—offenses He’s already forgiven. Competition will disappear, as the goal becomes less about ourselves and more about preaching the gospel (Philippians 1:15-18). John the Baptist was a fiery preacher, yet he evinced true gentleness when he said, “[Jesus] must become greater; I must become less” (John 3:30). Gentleness also means giving up the right to judge what is best for ourselves and others. God is not as concerned with our comfort as He is concerned with our spiritual growth, and He knows how to grow us far better than we do. Gentleness means that we accept that the rain falls on the evil and the just and that God may use methods we don’t like to reach our hearts and the hearts of others. Finally, to live in a spirit of gentleness toward God is to accept His judgment on people and issues. We tend to think it is gentle to go easy on people and try to justify actions that God has called sin. Or to let someone continue in sin without speaking the truth. But Paul says, “If anyone is caught in a trespass, you who are spiritual restore such a one in a spirit of gentleness” (Galatians 6:1). This doesn’t mean to be so soft that the sinner doesn’t realize he’s sinned. It means to confront the brother in a manner that is in line with Scripture—to be mild, loving, encouraging, and clear about the holiness that God calls us to. Jesus gave us the perfect picture of gentleness: “See, your king comes to you, gentle and riding on a donkey” (Matthew 21:5), and now He offers us His gentleness as a gift. If we allow the Holy Spirit to lead us, we will be filled with fruit of gentleness. Modern examples of gentleness are distinctly uncommon. How do we stay above the harsh, cruel and angry world around us? Apologize quickly after “rants” and “emotional outbursts.” We are human beings with powerful emotions and these will happen, but a gentle person will realize how the things they’ve said might have affected others and will apologize, seek to make amends and seek to gain the self-control that will prevent such outbursts in the future. Remind ourselves of God’s gentleness with us. Chances are, we would not want to be on the receiving end of our own “gentleness”; and that is a problem. How would we want God to correct us or point something out to us? The way we do to others? Many times, probably not. Think about what our attitude looks like. For example: When we see someone doing something wrong, is our club out ready to bash some heads? Or, instead, is our notebook out with ideas of how to help someone overcome a sin? Getting these pictures in our heads often makes us aware of our lack of gentleness and will eventually get us reaching for the notebook or Bible rather than the harsh words or the club. Being gentle doesn’t mean that we should not be strong in our beliefs, but it does imply that we should be wise and loving in expressing those beliefs to others. God shows tough love and teaches hard lessons to humans, all the while being the very definition of gentleness. This entry was posted in Faith, Inspiration and tagged Faith, fruit of the spirit, gentleness, Inspiration. Bookmark the permalink.